Recognized as shareware client for Windows operating system, The Bat! suits best to the advanced users who are every time in hurry to make the things quite convincing in the short time period. Due to user-friendly interface and exceptional filtering abilities the tool is quite popular among professionals of most of the organizations. However, this email application provides a bit basic icons that previews an outdated look, but even if you click on this icon, it doesn’t provide any text clue. In fact, there are times when users using The Bat! 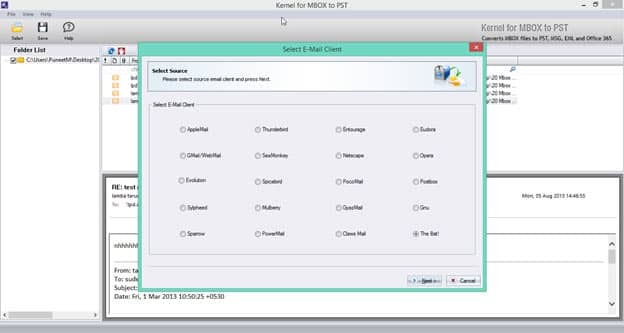 email client face difficulty in viewing list of messages. Clicking on account properties fail to provide view of messages. 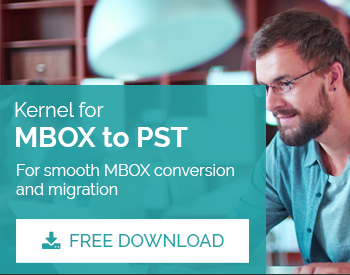 Because of all these above drawbacks, many users nowadays are looking out to migrate mailbox from The Bat! to Outlook platform. 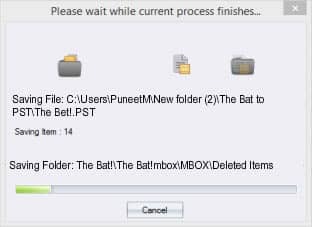 Select ‘The Bat!’ from the available MBOX clients. Click ‘Next’ to add The Bat! MBOX files using ‘Add File(s)’ button. Click the ‘Remove File(s)’ button to remove the MBOX file that got selected by default and you don’t require to migrate. A new window with detailed information on added MBOX files will be displayed. Finally, to save the required file click ‘Save’ button. A window with different conversion options will open. It comprises of ‘Convert all items’ and ‘Define Conversion Rule’. 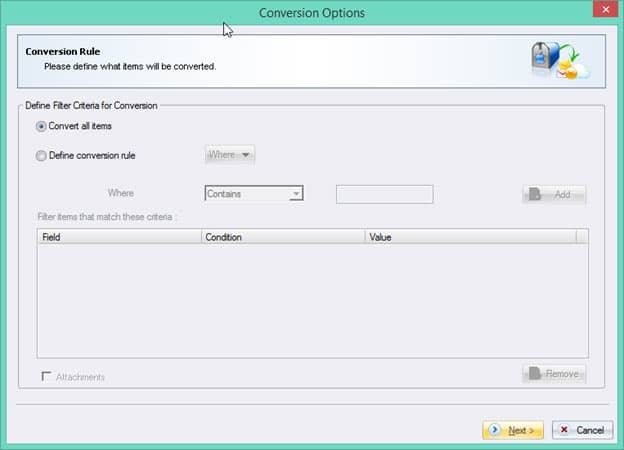 To save all the items click ‘Convert all items’ and click ‘Next’. To save specific The Bat! 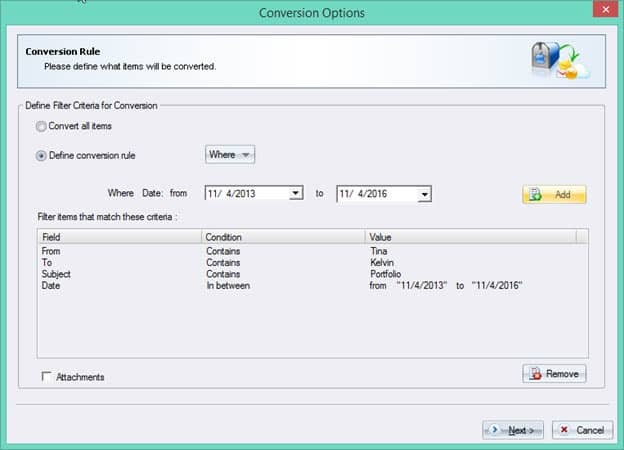 MBOX files, a user has to define different criteria like From, To, Subject and Date from ‘Where’ drop-down menu of ‘Define Conversion Rule’. Specify the required value in the “From” field. Similarly, provide the values in “To” field, as per the requirement in MBOX to PST conversion process. ‘Subject’ filed is also colonized with the values and choices like ‘Contains’ or ‘Doesn’t Contain’. Enter the required value for “Subject” field. Enter the date range by using “date” field. Once done click ‘Next’ to proceed. 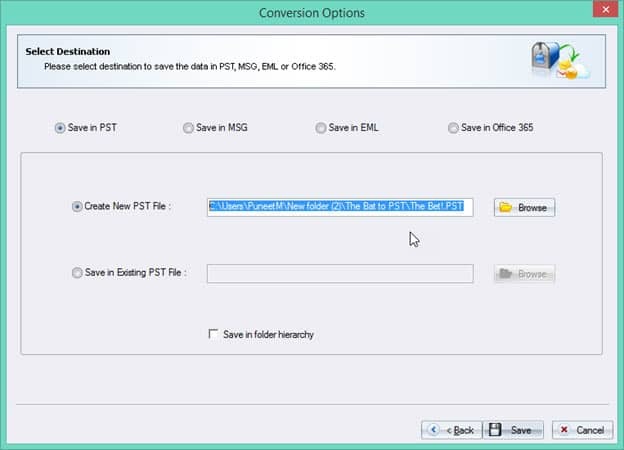 In next window select ‘Save in PST’ among other options like ‘Save in MSG’, ‘Save in EML’ and ‘Save in Office 365’. 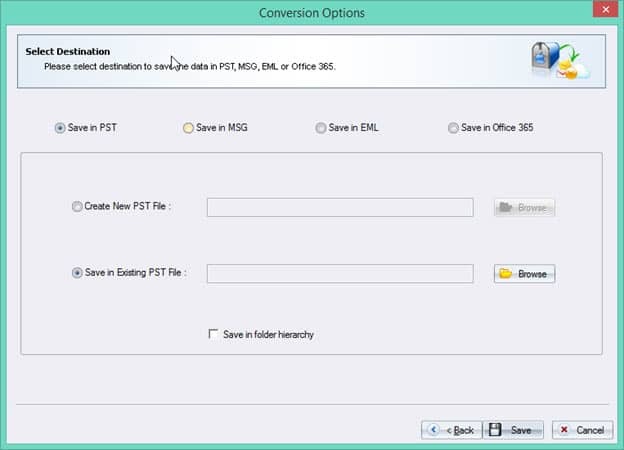 Moving to the next step, choose among ‘Create New PST File’ and ‘Save in Existing PST File’. 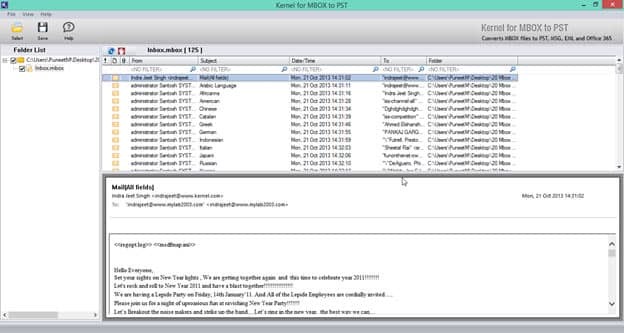 To migrate the required data in a new PST file, select ‘Create New PST File’, click ‘Browse’ button to provide the path of the resultant file. To migrate and save the required data in the pre-existing PST file, ‘Save in Existing PST File’ and just provide the destination file path using ‘Browse’ button. On the completion of the MBOX file of The Bat! to PST conversion process the message will be displayed on the screen.